“Star Wars: The Force Awakens” skyrocketed to a record $153.5 million in North America over the Christmas weekend, blowing its competition and the box office record book into a galaxy far, far away. The seventh entry in the beloved sci-fi adventure franchise has made Hollywood history every day since its debut on Dec. 18, and this weekend, the J.J. Abrams-directed sequel recorded the best first week ($391 million), best Christmas Day ($49 million) and best second weekend at the domestic box office that any movie. “The Force Awakens” also beat the former second weekend mark of $106 million set by “Jurassic World” in June by nearly $50 million. And it drove the biggest Christmas box office weekend ever with roughly $300 million, Rentrak reported. The former high for the three-day holiday weekend of $269 million was set in 2009, the last time Christmas fell on a Friday. In the process, “Star Wars” lifted its worldwide box office haul past the $1 billion mark in 12 days of global release. That’s faster than any other movie in Hollywood history, beating the 13 days it took “Jurassic World” to get there in June. 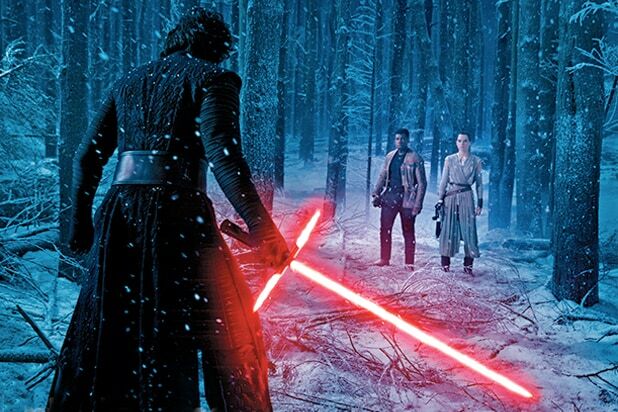 “The Force Awakens” took in a spectacular $286 million worldwide this weekend, with $133 million coming from overseas. That lifted the global total to $1.09 billion, with $546 million coming from abroad — without China — and $544.5 million from North America. The record-breaking binge by “The Force Awakens” overshadowed a very strong debut by “Daddy’s Home,” the Mark Wahlberg-Will Ferrell comedy that was second with $38.8 million — about $15 million above projections — for Paramount. The critics may not have liked the PG-13-rated “Daddy’s Home” (28 percent positive on Rotten Tomatoes), but the audience gave it a “B+”CinemaScore. Finishing third was “Joy,” writer-director David O. Russell‘s comedy-drama starring Jennifer Lawrence as a millionaire miracle mop inventor, which took in $17.5 million in its debut for Fox. It’s the weakest of Russell’s recent films in terms of reviews (57 percent on Rotten Tomatoes) but that didn’t stop mature women — the target market — from turning out in force. The audience was 66 percent female and 77 percent over the age of 25. Sony’s “Concussion,” starring Will Smith as the doctor who discovered the NFL’s epidemic of head injuries, was sixth with $11 million. But the best news out of the weekend for Sony may have been the “A” CinemaScore that the drama received from moviegoers, which will help it play in the coming weeks as the football season comes to a climax. “Concussion” finished behind second-week holdovers “Sisters” ($13.8 million) and “Alvin and the Chipmunks: Road Chip” ($12.7 million). The Tina Fey-Amy Poehler comedy duplicated and may actually have topped its debut last week for Universal, while Fox’s kids movie fell off just 11 percent from its opening. “The Big Short,” Paramount’s Oscar hopeful that examines the recent U.S. economic meltdown, was seventh with $10.5 million from 1,585 theaters in its nationwide expansion. “Point Break,” a remake of the 1991 cult classic, wasn’t far behind that with $10.2 million in its debut. That’s a little above very modest expectations for the expensive action film starring Luke Bracey from Alcon Entertainment and Warner Bros. Unless things improve rapidly, it will be the studio’s fourth bomb of the year with a production budget of more than $100 million. “The Hateful Eight,” from writer-director Quentin Tarantino, cracked the top ten with $4.5 million from just 100 theaters. They were all equipped with 70mm projectors to show the frontier thriller from the Weinstein Company in that format at the director’s request. In more good news for Tarantino, police unions across the country called off a planned boycott of the film on Saturday, a week ahead of its nationwide rollout. The union said they didn’t want to give the film or Tarantino — who they felt made anti-police comments at rally against police brutality — any more publicity.